There are a variety of ways people can become entrepreneurs. Some people stumble upon it, others fight for it, and some go to school for it. In our daily lives, entrepreneurs are constantly finding moments of inspiration, whether it’s when we’re listening to the radio, going to the vending machine at work, or watching TV. Here are some of the unique ways that people have become entrepreneurs all because of a good idea. It was 1995 when a loaf of bread cost $1.15, a US postage stamp cost 32 cents, and it only cost $4.35 to go to the movies. A popular movie that year was Billy Madison which starred the still famous, Adam Sandler who played an immature adult who had to repeat grade school in order to inherit his father’s hotel business. The workforce is at a generational crossroads. As many baby boomers near retirement age, millennials have gobbled up one third of America’s workforce. Generation X is bookended by these two monstrous population groups. EO's local chapter for Philadelphia, PA has counted seven members who have made it to the prestigious list this year. Philadelphia, September 12, 2016: Among the 5000 superheroes of the US economy recognized by the 2016 Inc. 5000 are nine members of Entrepreneurs’ Organization Philadelphia (EO Philadelphia): Pathfinders, IT LLC, Millennium Surgical Corporation, Expo Logic, Square 2 Marketing, Holganix, Centennial Lending Group LLC, The Dagit Group, J2 Solutions, LLC, and Clear-Coat. During a recent retreat with my fellow forum members from the Entrepreneur’s Organization, we challenged each other to make a “Bucket List” of all of the things we want to accomplish in life before one day, we inevitably “kick the bucket”. Our goals were varied, inspirational, and ambitious to say the least. Then, instead of considering them as dreams far off in the distance, we were told to pick one and make it happen. When I wrote, “Learn How to Fly a Helicopter,” on the bucket list, I never thought that I’d be 2,000 feet up in the air the following weekend. For months thereafter, I ran to the heliport every chance I could get, and every day between business meetings, I would sneak a peak at my flash cards in my back pocket. 1. Altitude: Though it seems scarier to fly at a high altitude, it is often more difficult to fly closer to the ground. There’s no time to correct errors. Much like running a startup or a relatively small company, we don’t have the financial and human resources that large corporations have at their disposal. There’s no cushion of air to cradle a fall. Speed is life, altitude is life insurance. 2. Attitude Awareness: Contrary to popular belief, helicopters don’t fly in a level straight line. Pilots maneuver the helicopter’s nose down to move forward. In fact, if the chopper’s nose is angled too high up in the air, the aerodynamics push it backwards. Think about that the next time you run the risk of getting too proud of your business accomplishments. 3. Autorotation: Autorotation is the way helicopter pilots land safely by using the rotor blades’ momentum for additional control. It’s only one of many emergency procedures that you train on over and over again. So, what happens if the engine dies while you are up there? Think about to what degree you give your team aspirational motivation and then compare it to the amount of time you dedicate to preparation for emergencies. Helicopter training heavy focuses on emergency procedures and redundant checklists. They never teach you to appreciate the view. 4. Failed Approaches: The ideal angle of approach for landing a helicopter is 14 degrees. You line up the runway or get that helipad right in your sights and then something goes wrong. It’s not a big deal, it’s called a “failed approach”. You give up, fly around in a circle, and try again. In business, there’s always another prospect. Alternatively, helicopter pilots have enough training to improvise with experienced calculation. When attempting to land, changing circumstances and pilot error sometimes require a steeper or shallower angle of approach. In business, just when you notice you are slightly off, make a tweak, lose the plan, and go for it, based on what you already know. 5. Controls: There’s no steering wheel. Piloting a helicopter or running a business takes a lot of coordination. With so many things that can go right or wrong, both are like juggling chainsaws while balancing on a beach ball. It’s all about pulling the right levers at the right time. The “cyclic” is the main control stick. It alters your “angle of attack”. As a CEO, you can grab the helm, but the rest of your business better be in proper working order to have a safe flight. Aptly named, the “collective” is the stick by your side, which operates the rotor blades in unison. It’s a constant reminder that how well you work as a team will dictate whether you climb or descend. Once you start, there’s no stopping or slowing down. Those pedals at your feet? Just anti-torque pedals. There’s no gas pedal and you can’t slam on a brake. They allow you to push against the forces that come your way, but which direction you face is up you. 6. Course Correction: At a distance, it looks as if helicopter pilots fly perfectly. The same could be said for entrepreneurs. Surprisingly, helicopter pilots are never on a perfect path, but on the contrary, they are typically a little bit off. They continuously make micro-movements to correct their course. Business leaders are also constantly making course corrections. Even your entrepreneurial heroes are not perfect. 7. Dirty Air: As a helicopter moves forward, it leaves a wake of chopped up air behind it, which can get in the aircraft’s way and limit its ability to move efficiently. Be aware that even when you are in the process of overcoming obstacles, positive efforts can also produce unintended negative consequences. Looking ahead, getting traction, and making advances are great, but don’t forget to look at what it does to your business as a whole. Your people are working harder. 8. Horizon Frame of Reference: Unless there’s a bridge, a mountain, or a high-rise, disorientation can be par for the course, so you always keep your eye on the horizon to level out. Reminders to keep looking forward miles ahead, without being overwhelmed by what’s coming at you in every direction, nor the drop below is almost prophetic for an entrepreneur. 9. Magnetic Compass: Whether you are up in the air or leading your company, you can’t afford to get lost. Plus, nobody else can help you find your way when you are the visionary. That’s why the magnetic compass is positioned on the top of the windshield, front and center, positioned directly in the line of sight. Know your mission statement. It’s your “True North”. Dust off your employee manual and pull out your mission statement. Stick it right in front of you where you can read it every day. 10. Manifold Pressure: The manifold pressure gauge provides a warning for when you’re working your engine too hard. As an entrepreneur, you may not have one of these easy-to-read instruments handy, but if you don’t know when your staff is falling dangerously in the red, your business’ engine could stall and you could drop from the sky. As soon as you think of going for a helicopter ride with a professional, you think about the incredible view. However, if I invite someone to fly with me, all that I hear is about how dangerous it is. Perception is based upon perspective. People praise the accomplished doctor or the superstar lawyer, but once you tell them you’re an entrepreneur, they worry. Just like being an entrepreneur, flying helicopter requires the perfect combination of book learning and real world experience. There are no short cuts and it’s hard, ... really hard. You’re situated in a glass bubble cockpit. Your leadership is transparent. Your successes and failures are clearly visible for all to see. 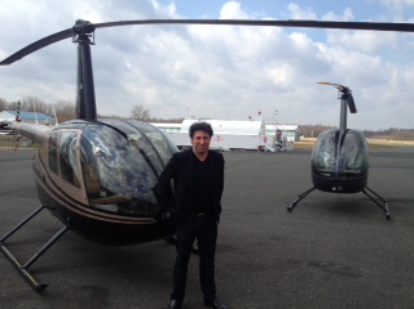 As a helicopter pilot or entrepreneur, there’s no rear view mirror. You can’t look backwards. If you think flying a helicopter might be for you, come join me. It will change your perspective forever. It’s the only time that I can truly focus and get away from the trials and tribulations of leading my company. My friends think that my hobby is flying helicopters. I think my hobby is “trying not to die.” The same can be said about my business. In life, entrepreneurship, or helicopter flying, there are risks, consequences, and rewards. If you don’t face your fears to some degree, you’re not living life to its fullest. Starting a company or flying a helicopter might be something not to put on your bucket list. However, if any of these 10 lessons resonate, strap in, face forward, and take off. Alon Barzilay is the founder and CEO of Barzilay Development, a cutting-edge real estate development company that reimagines urban historic buildings through innovative transformations. The company reinvents properties by blending the industrial texture of obsolete factories, churches, and warehouses with modern design sensibilities in the form of multifamily lofts. Alon Barzilay incorporates his passion for flying helicopters with his business by filming his latest loft projects from 2,000 feet up in the air, escorting potential investors on helicopter rides to see their portfolio from a birds-eye view, and he even uses remote controlled drones to film warehouse interiors. Alon Barzilay in an experienced lecturer to business groups and universities on the subject of the parallels between helicopter flying and entrepreneurship. For more information, please visit www.barzdev.com or email contact@barzdev.com. If you’re a baseball fan, this is a special time of year. Spring training retreats to Florida or Arizona can bring back crisp air, a crack of the bat, and the smell of grilled ballpark food. There’s a renewed spirit for your home team, and as you peruse the local box score, nothing is better than seeing a ‘HR’ from your favorite player. There was a time when female entrepreneurs were dissuaded from entering the business world. Even in the early 1990s this was commonplace. Look no further than the current box office hit “Joy”. We’re proud to announce a new title sponsor for 2016: Comcast. Joining a full slate of dedicated supporters, Comcast will be involved in several facets of the Entrepreneurs’ Organization Philadelphia Chapter. From event planning/hosting, providing executive-level speakers, and elevating the overall brand of the group, this is exciting news. For more on how EO members can benefit, please email eophiladelphia@gmail.com. How will you engage with the Entrepreneurs’ Organization in 2016? Aside from traditional methods, we have decided to bring more stories directly to you, the audience. Call it a resolution. The highs and lows of business leadership can be isolating, but it’s our mission to create a supportive community for positive intervention. What you’ll find here are personal success stories, relevant trends and topics of discussion from friends and peers. Look for a couple of these posts, as well as photo recaps from events during the next several months. If you’d like to contribute a guest blog, please email drowe@slicecommunications.com. We encourage your feedback. Are we listening closely enough to you? Let us know and check back soon. Hey, after all, it’s what we’re here for!